Creamy Chicken and Broccoli Pasta with a creamy lemon Parmesan sauce and plenty of chicken and broccoli for only 400 calories per serving. 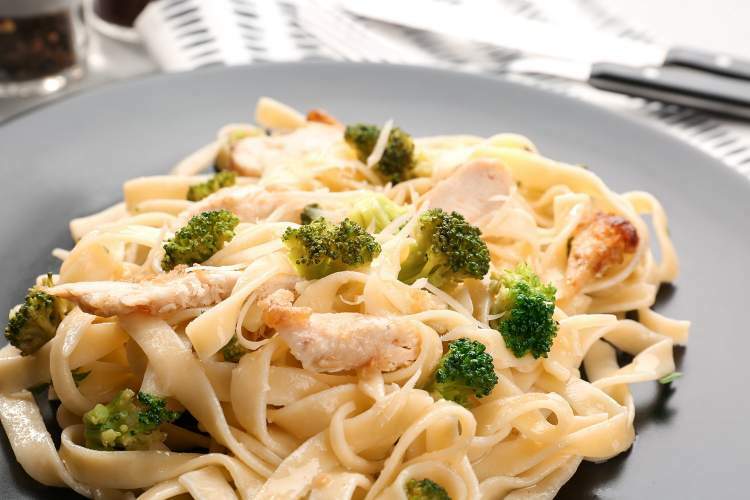 This easy Chicken and Broccoli Pasta is a healthier version of your favorite restaurant dish with the most delicious creamy Parmesan sauce, fresh broccoli, chicken, and a touch of lemon. Its comforting, filling, and has about half the calories of the restaurant version. We also love this Creamy Mushroom and Chicken Pasta. This dish was inspired by one of my favorite East coast pasta dishes – Chicken, Ziti, Broccoli. It’s something I haven’t seen much on menus since moving West but back home almost every menu has some version of this deliciously creamy and lemony dish. It’s usually a ridiculously huge plate of pasta (enough for at least three), tons of chicken and fresh broccoli, and a light lemony cream sauce. Then a mountain of Parmesan cheese. This version takes all those classic flavors but lightened up. It still tastes delicious but you don’t have to worry that your dinner has more calories than you should eat all day. The key to making this dish is the lightened up cream sauce made with a combination of 2% milk and chicken broth. No cream needed! The pasta is cooked in the liquid so that the pasta starch combined with the broth and milk to create a delicious, creamy sauce. It’s a great trick for making any lightened up sauce. Then the Parmesan cheese is stirred in and you have one amazing sauce. Although I usually use chicken breast, you could also use chicken thighs or shrimp in the recipe. If you decide to make it with shrimp, just be really careful about not overcooking the shrimp since they cook so quickly. For a vegetarian version, just leave out the chicken and use vegetable broth instead. You could fold in some chickpeas or white beans for extra protein and fiber. If broccoli isn’t your favorite veggie, you could use asparagus, cauliflower, broccolini, zucchini, or a combination of your favorite veggies instead. To switch up the flavors, consider swapping in a different cheese. Creamy goat cheese or feta cheese would taste amazing and totally change the flavor profile of the dish. If you don’t like things spicy, leave out the red pepper flakes. For extra flavor, consider stirring in some store-bought or homemade pesto. This really kicks things up and the creamy pesto flavor is insane. You can use pretty much any kind of pasta for this recipe. Many people like it with penne, ziti, or shells since the sauce really sticks to tubular pasta shapes. For a thicker, creamier sauce you can use fat free half and half instead of the milk. You can also use canned evaporated skim milk, which is thicker and creamier. This will create more of an alfredo style sauce. For extra cheesy pasta, add some extra Parmesan cheese or melt some mozzarella cheese on top before serving. For extra lemon flavor, add the zest of the lemon as well. If you love tomatoes, consider adding a can of drained diced tomatoes to the dish. Halved cherry tomatoes are also really yummy in this dish. For a creamy red sauce, add about 1 cup of marinara sauce to the final dish. What type of pasta is best for this recipe? You can use almost any type of pasta for this Chicken and Broccoli pasta recipe. Regular, whole grain, and high fiber pasta all work. You can also use any shape of pasta you like – spaghetti, shells, ziti, penne, or any other pasta shape. Some people haved asked if this will work with alternative pastas like those made with chickpeas and lentils. Honestly I haven’t had a chance to try that yet, so I am not sure. If you try it – let us know! Since the chicken broth adds a lot of flavor to the sauce in this recipe, I like to use a really flavorful high-quality chicken broth like this one or homemade if I have some in the freezer.